Every year I throw a Pinterest Party where all my girlfriends get together for a fun crafting day. With an apartment overrun with baby stuff it was hard to justify hosting it this year, so a good friend volunteered her home instead. Thankfully her husband was willing to let us take over their home for the afternoon! Once she gave me the go-ahead to throw the party at her house I knew I wanted to bring her something as a thank you, but what? I’ve always found it difficult to bring hostess gifts to a party. You never know what someone will need or even want. A lot of times those gifts tend to get thrown in drawers never to be seen or used again. I never want to go into a situation where I give a gift that won’t get any use. 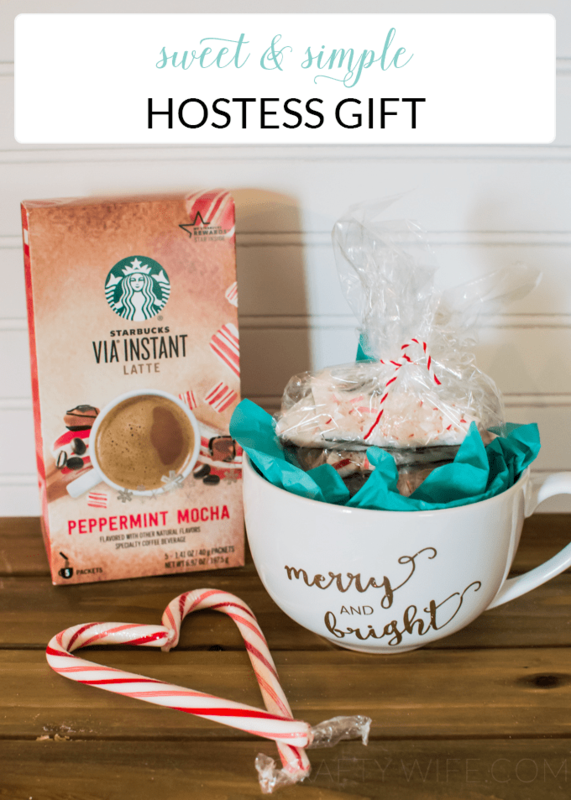 So as I was trying to come up with a simple hostess gift for my friend, my goal was to give something sweet that I knew had the potential of being used rather frequently. And what better gift to give than a homemade mug? Because everyone loves a hot beverage this time of year! Since it’s the holiday season and we all either love coffee or hot chocolate (or both! ), I decided a peppermint theme complete with a coffee mug was what I wanted to make. I saw this delicious Peppermint Mocha Starbucks mix at Target (seriously, it’s my absolute favorite drink!) and decided that’s what she was getting. I also made my very first batch of Peppermint Bark ever (it came out great!!!) and wrapped it up with red and white twine to include as well. As y’all know, I love my Silhouette . We have a good thing going. It creates beautiful art pieces and I get all the credit. I love it. So it was kind of a no-brainer on what I would use to create the gift. For the mug, I designed the saying with my silhouette software and used permanent vinyl (also known as oracle 651) for the application. Just remember, this stuff is not dishwasher or microwave safe! So if you’re giving a mug like this as a gift don’t forget to tell the recipient. This design was fairly easy to put on the mug, but I would suggest that you go slow. Mostly because I didn’t and made a mistake. But, I don’t think it’s overly noticeable unless you really know what you’re looking for. I’ve really got to learn to slow down! I’m pretty excited about this hostess gift, because I know that it’ll be used a lot! Everyone loves a hot drink on a crisp cold day, right? Do you bring a hostess gift when going to a party? What’s your favorite thing to give or receive? For more Silhouette inspiration, check out these crafts! I love it!! It’s so super cute and best of all…it holds my favorite drink…coffee 🙂 I love that you have a Pinterest party. How super fun!! Thank you, Crystal! We’ve been doing Pinterest parties for the past few years and they are always so much fun. A great excuse to get together, eat good food, and craft.